“Wow!! What a bird!! Best turkey I’ve ever had, really delicious. Followed the instructions to the letter and came out beautifully cooked. 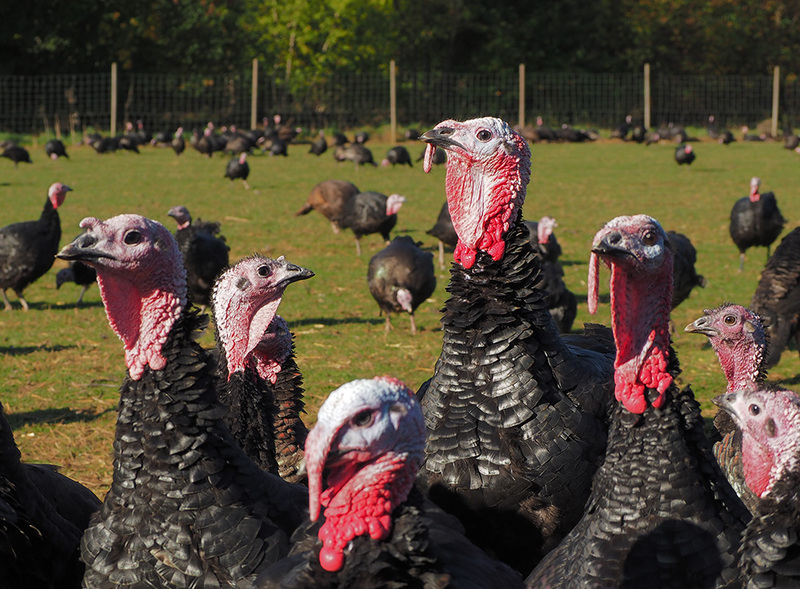 We produce free range bronze turkeys, a traditional slow-growing breed with enhanced flavour and quality. 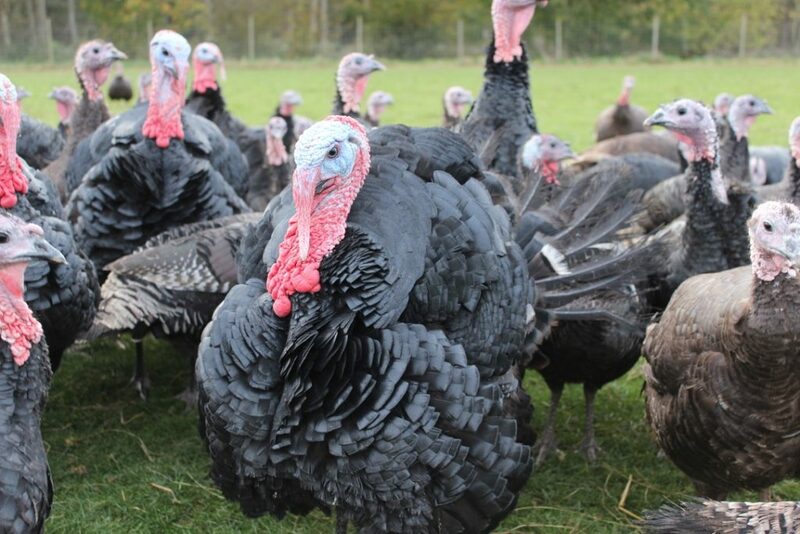 Our bronze turkeys are free to roam in large grass paddocks all day and are reared to maturity, skilfully hand-finished and ‘game hung’ for 10 – 14 days for a superior bird. 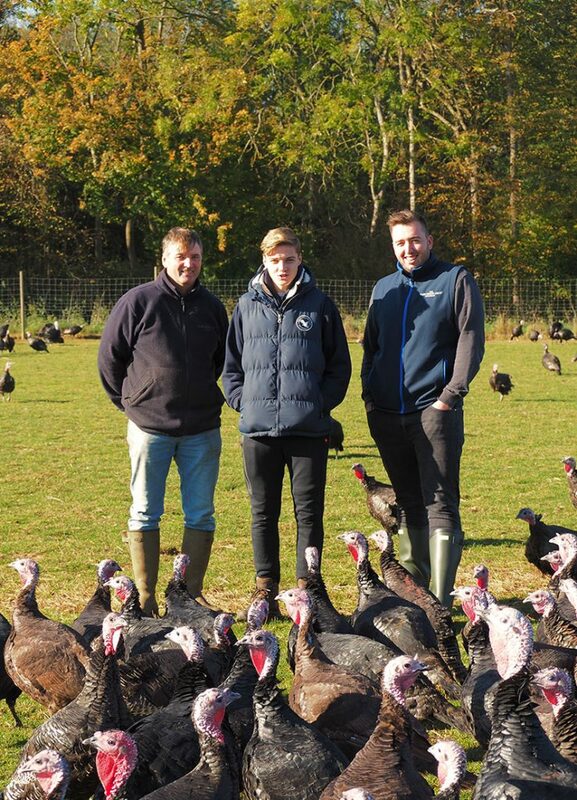 With over 35 years of experience rearing turkeys here at Herons Farm, we are proud to be members of the Golden Turkey Quality Assurance Guarantee a group of independent family-run farms supplying fresh traditional turkeys for Christmas. 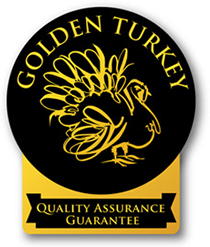 The Golden Turkey Quality Assurance Guarantee sets the standard for the very finest quality Christmas turkeys – you won’t find these turkeys in your supermarket. Golden Turkeys are exclusively slow-growing, traditional breeds produced to the highest ethical standards and fed only natural foods which means you are guaranteed the finest texture and flavour for the most important meal of the year. Golden Promise Turkeys are raised in the old fashioned way by caring farmers who are members of the Traditional Farm-fresh Turkey Association (TFTA). Reared and produced with the greatest care by independent farmers dedicated to the production of the finest truly Traditional Farm Fresh Turkeys, who are committed to this code. Grown slowly to full maturity and prime condition. Fattened on rations containing at least 70% cereals with no animal protein and never given antibiotics or other additives for growth promotion. Housed in buildings giving both natural light and ventilation while providing essential weather protection, with space at or better than the Animal Welfare Code recommendations. Grown on farms that are independently inspected to ensure that the Code is met in full. Slaughtered on the farm to avoid stress from long distance transportation. Always dry plucked and hung for a minimum of seven days to mature and develop the natural flavours unique to this traditional type of production. Processed in facilities inspected by the local Environmental Health Officer to ensure that all legislation is fully complied with. Individually inspected and examined before qualifying for the Golden Promise guarantee to be affixed. Supplied with a money-back commitment in the unlikely event of consumer dissatisfaction. This commitment is guaranteed by the TFTA. Your Blackwells Turkey comes to you in a beautiful box complete with a pop-up timer. As soon as possible after collecting your turkey, remove all packaging and store in a cool place, preferably the bottom of your refrigerator. Giblets are included in a small plastic bag. Remove these and keep separately in a cool place. The bird is best cooked within two to three days of purchase. Remove the turkey from the fridge 2 hours before cooking. Do not stuff the cavity, as this will stop the turkey cooking properly. Instead, place a large Bramley apple or peeled onion inside. Season the bird with salt and pepper, then place it breast side down, in a roasting tin. If desired, you can place the giblets around the bird. The oven should be preheated to 230°C/450°F/ Gas mark 8 and the bird cooked at this temperature for 30 to 60 minutes, depending on size, before reducing the heat to 190°C/375°F/Gas mark 5. Aga hot oven. About 30 minutes before the end of cooking, turn the bird carefully on to its back to brown the breast. It is very important not to overcook a turkey – many people do and are then disappointed when it is dry. This can be avoided by using the ‘pop up’ timer included in your turkey box which detects when the turkey is cooked. You can also test with a fork on the inside of the thigh – when the juices run clear the bird is ready. After removing the turkey from the oven and before carving, allow it to rest for 30-45 minutes. Do not cover. Drain off the juices from the bird, and keep warm.